Today, our hearts are heavy, and the Tower is dark. At 6:45 p.m., our Wesley went to be among the stars. 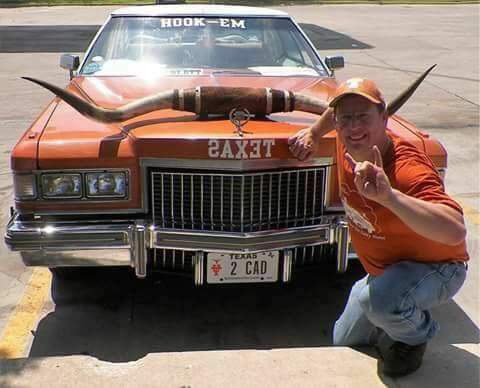 Horns up! The Eyes of Texas will forever be upon you, sweet Wes. You have touched so many, and will live on in all of our hearts. greats. Tell DKR we miss him. Now you get to be at ALL of the games, anywhere, and walk with the greats. Tell DKR we miss him. I never met Wesley Allen, but I know him well. I followed his journey from beginning to end on Facebook. Wesley's story represents all that is good about friends, loyalty, and passion. For Wesley everyday was a national championship day with a burnt orange tower. 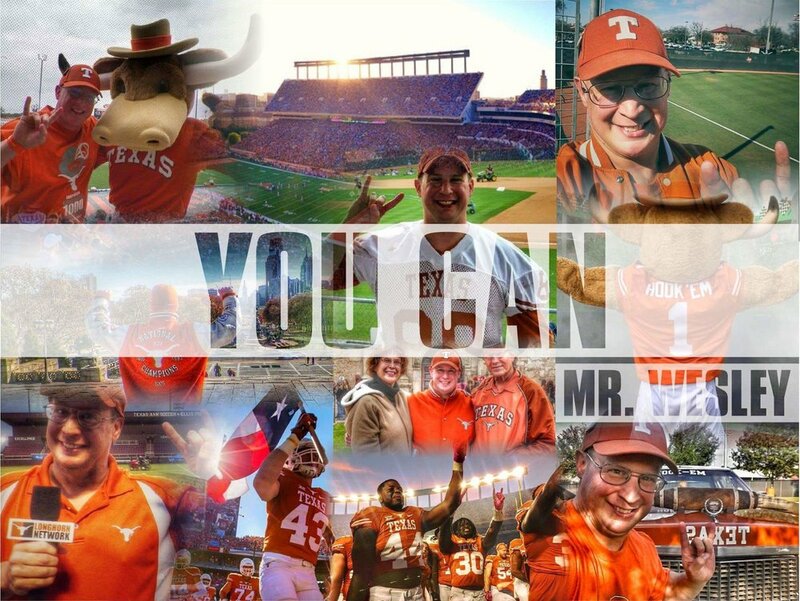 His life reflected the #1 spirit of the #1 fan of the Texas Longhorns and his spirit consumed everyone he met. 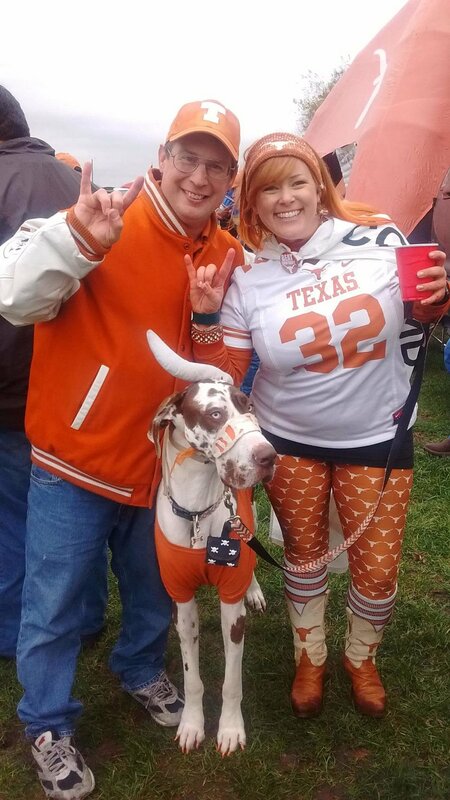 There are all degrees of Longhorn fans. “Donor” fans who expect results for their money; fair weather fans that leave when the team loses; critical fans who pretend to know what they are talking about; "expert" fans who are unknown drips (expert is derived from two Latin terms- “x” meaning unknown and “pert” meaning a drip); faux fans who are the lowest form of fans; loyal fans who did not attend Texas; Loyal fans who did attend Texas and who will always possess a equity stake in the Longhorn nation; and then there Is the ultimate Longhorn fan- Wesley Allen. Wesley was the quintessential fan -passionate, pure, sincere, unwavering, uncomplicated, and indefatigable. Wesley earned his friendships with Longhorn Head Coaches, team members past and present, UT administrators, and 1000’s of others. His friends knew the purity of his heart, and they admired his glowing, eternal, and contagious spirit. From Scott Wilson- My friend Wesley Allen just passed away a little while ago. He was a great guy and a great Longhorn. We will remember his spirit always and know that he is in a better place. Please keep his family in your prayers. 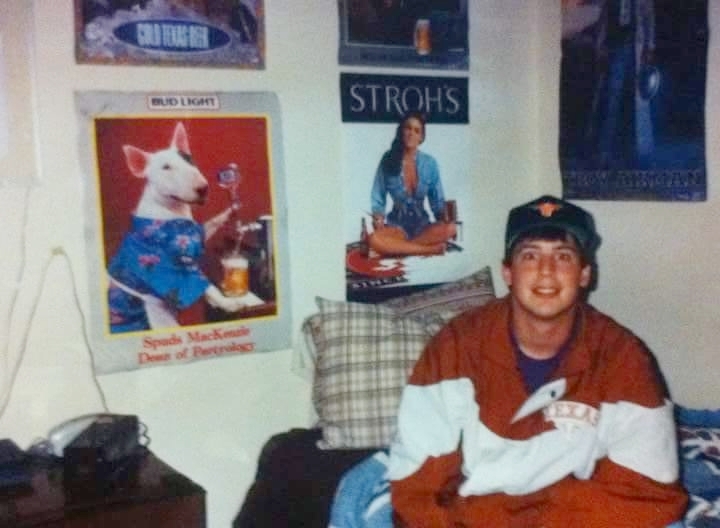 Hook'em always, Wesley! 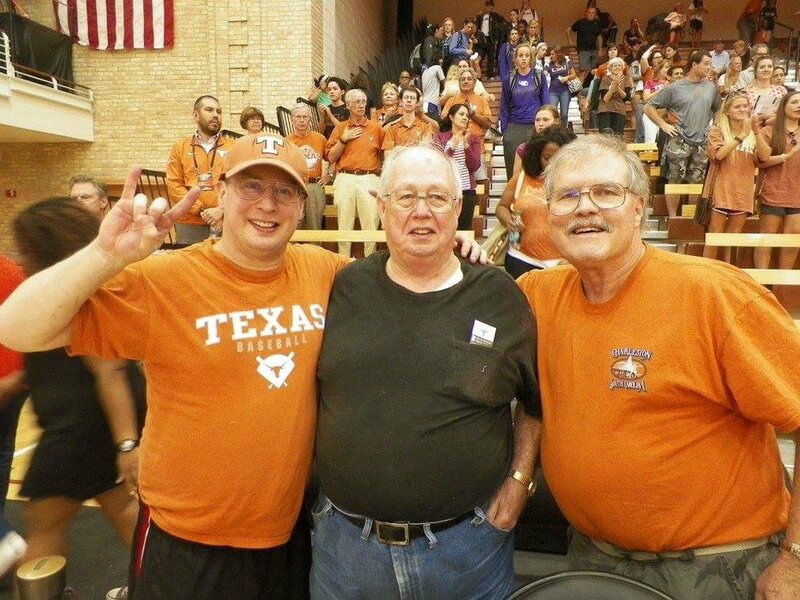 Corry Johnson So sorry to hear about this Scott Wilson Another great Longhorn fan is now gone. I'll always remember meeting Wesley for the first time out at Stanford during Ben's freshman season. Wesley asked me to take a picture of him at the Sunken Diamond....His Horns Up! 🤘 all the way and his great big smile. 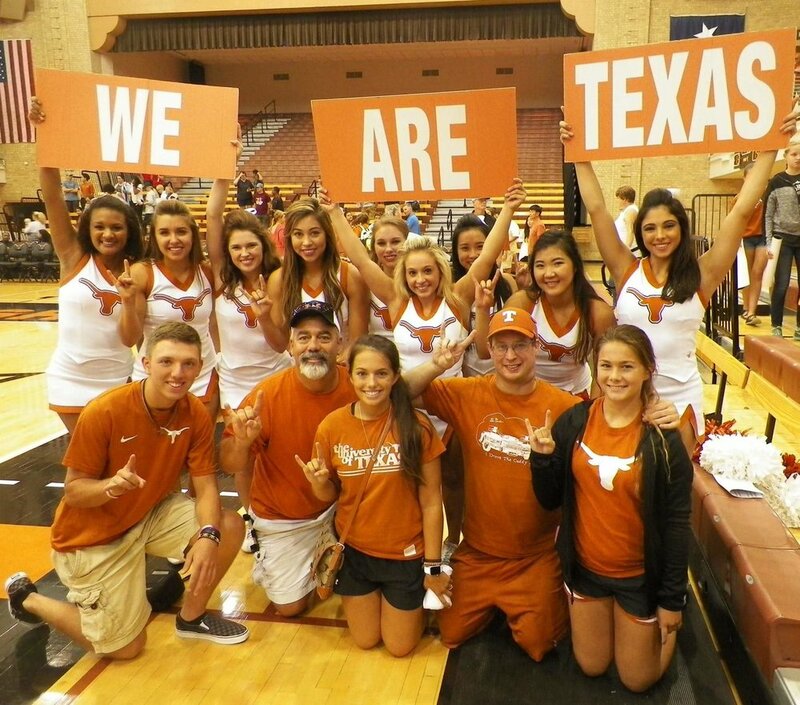 Always had a big smile and always cheering for his 'Horns. I also got such a kick out of the recent video of Wesley getting the phone call from VY too. He was so happy, so appreciative and so excited to talk with VY. Between Wesley and John Kelso you've lost some really great friends recently. My condolences out to his family and to you as well with the tough loss of two close buddies. Shea Daugherty "Horns Up" for Wesley! He will be sorely missed by the Longhorn Nation. I like what Liz said about the sunset getting a little more burnt orange... he'd like that. Cynthia Aranda My condolences and heartfelt thoughts in this time of sorrow! You were a good friend to Wesley, if not his best friend. I will always remember and thank you for introducing me to him. Because of you I was blessed to have Wesley as a huge part of my life over the past few years. Not long enough, but still enough time to make amazing memories to last a lifetime! David Wheeler So saddened to hear this news but I thank you for introducing me to Wesley. We attended many softball games together this year getting to know each other like brothers. May he RIP! Kurt Zeitler What a positive person. I wish I could be as graceful in life as he was facing death. All Longhorns mourn his passing. Rita Bigley Knight-Shaw My prayers are that his passing was peaceful for his fight has been so great.....what a young man of strength he was......all young men should be like him.....love you forever Wesley! Skip Menard Very sorry Scott. Really got to know him last year. He is and always will be a GREAT LONGHORN FAN! He is wearing his Burnt Orange Wings Proudly! I as well as you are Absolutely sure he will be watching and doing everything he can to give the Texas Longhorns the mojo to win! Written by Julie A. Simmerman -The Son has Set for Our Dear Faithful Friend and Longhorn Brother Wesley Allen. He entered Heaven's Gates last evening at 6:45 pm. You will be Greatly Missed and Remembered by All the Lives You Touched. "Enter in Wesley". "You have finished the Race". "Well Done Thy Good And Faithful Servant". Wesley Lloyd Allen passed away on September 6, 2017 at the age of 44, departing from the loving care of his family into the Lord's eternal presence after a courageous battle with cancer. Wes was born on August 15, 1973 in Conroe, Texas and was a graduate of Trinity High School after playing football and baseball. 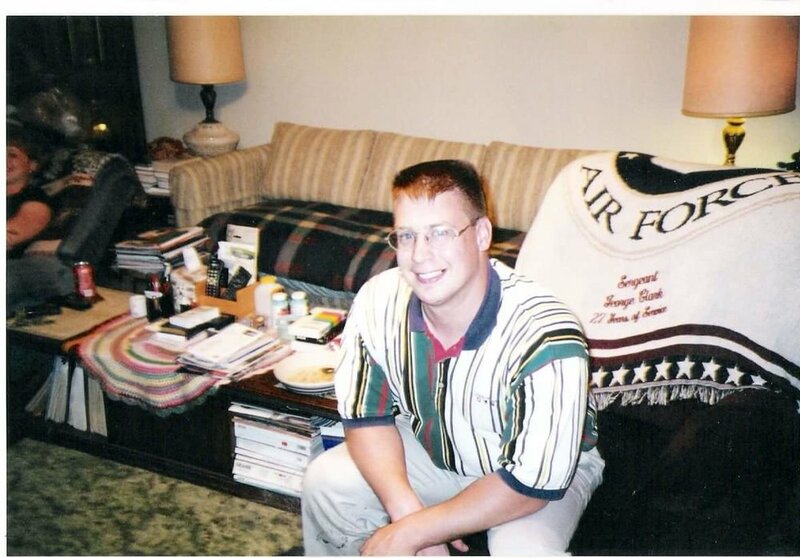 A 1997 alumnus from Sam Houston State University, Wes worked as a teacher and for many years with HEB grocery. Wesley was a loyal attendee of Longhorn games even when he was fighting cancer. Wesly was a kind and gentle soul with a zest for life that was infectious and lifted up those around him, both emotionally and literally. Anyone he knew that entered his presence was typically treated with the warmest of greetings followed by a bear hug that would lift you off the ground. He was devoted to his family and friends who will all miss him dearly. Witnessing his enthusiasm and vibrant spirit persist through difficult cancer treatment was an inspiration. His Christian faith allowed him to approach his diagnosis with grace, determination and no regrets. 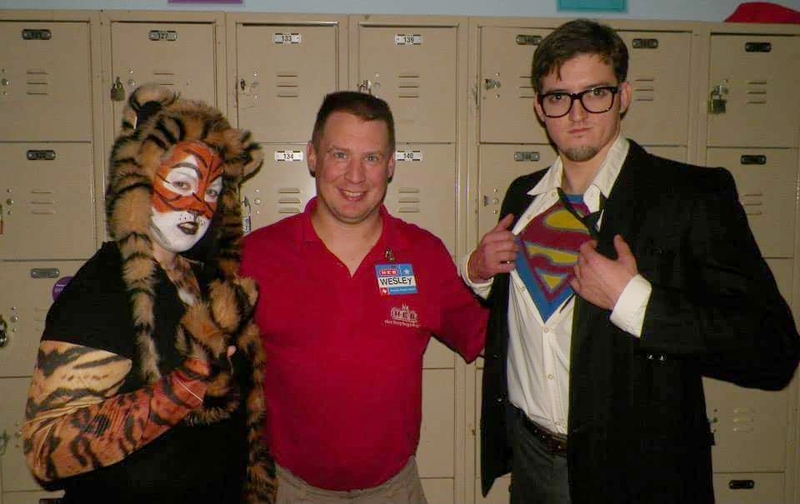 An avid fan, Wes was an encyclopedia of sports. He traveled far and wide to attend high school, college and professional events. Whether it was a volleyball game involving an old friend's daughter or attending a hallowed stadium or arena with his buddies, Wes found the joy that sports are supposed to bring. 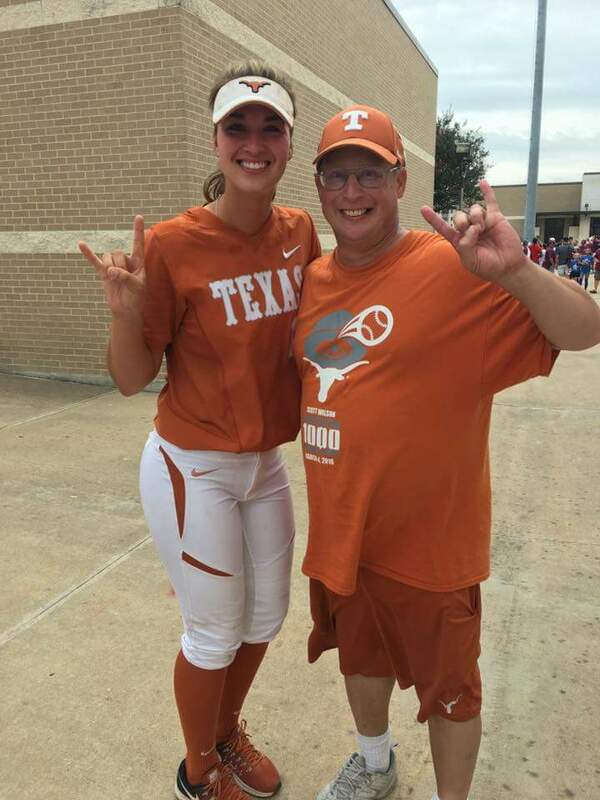 There was no bigger devotee of the Texas Longhorns and he attended their football, baseball, volleyball and basketball games across the country. 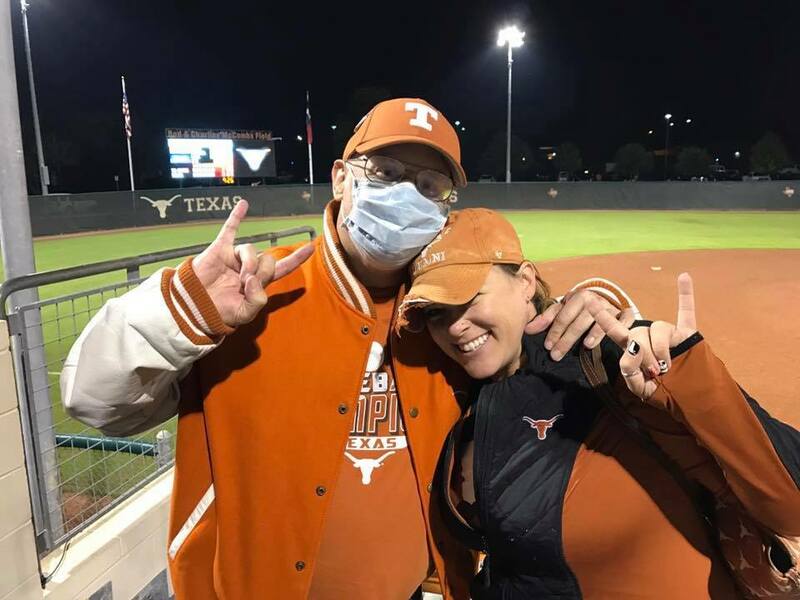 The response from his Longhorn family buoyed Wesley's spirits over the last year as platers, former players, coaches and fans expressed their love. We all will treasure the moments when he would burst into a smile while showing you his latest vintage video from an old Southwest Conference classic. With a family full of Longhorns and Aggies he always loved us all and kept the proper perspective on the competition. Wes is survived by his parents Connie Baca and Toby Allen; sister Debra Cox and husband Dave; grandparents Ferrell and Franceil Reagan and Lloyed and Bell Allen; and many uncles, aunts, nieces and nephews. 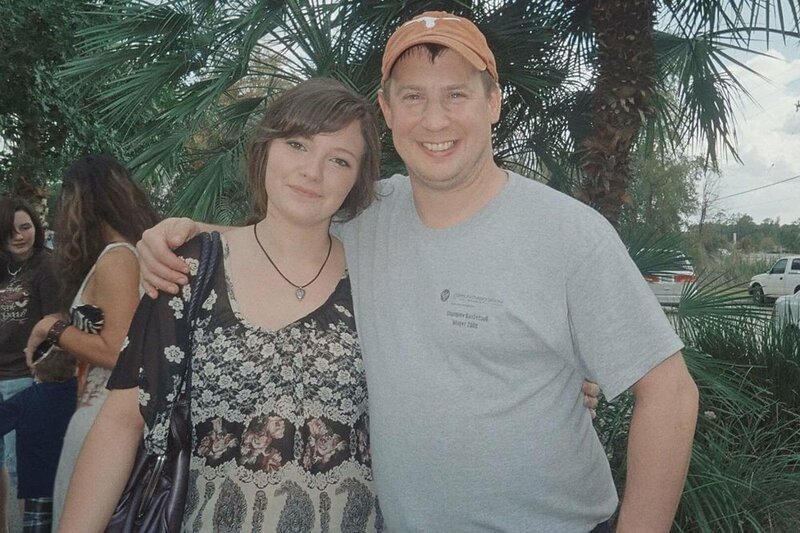 The family wishes to thank Wes's team at MD Anderson for their care and compassion during his treatment. A visitation will be held from 12:00 to 2:00 at Neal Funeral Home. A celebration of his life is scheduled at 2:00 on September 12 at Neal Funeral Home. Honored to serve as pallbearers are Travis Reagan, Sam Reagan, Johnathan Clark, Allen Cheatham, Shane Shields, and Larry Eatough. Please go online to sign the registry at www.nealsh.com. Donations to honor Wes may be sent to American Cancer Society or M. D. Anderson.